Ubisoft has confirmed that the next Assassin’s Creed game will be "Odyssey". The new game will be revealed at E3 2018. Assassin's Creed Odyssey was released on PS4 199d ago in the US and the UK. Based on 32 Assassin's Creed Odyssey PS4 reviews, Assassin's Creed Odyssey gets an average PS4 review score of 85. The score for all versions is 85 based on a total of 46 reviews. I’m not sure that I want a third game like this next year, but as far as follow-ups go, Assassin’s Creed Odyssey is pretty fantastic. For all its epic scope and boundless entertainment, time won’t be a problem for Assassin’s Creed Odyssey. It’s the culmination of the series own journey, and only fitting it be called Odyssey. Assassin's Creed Odyssey is simply the best in the series and one of the finest open-world adventures available. This is a voyage you don’t want to miss. Assassin's Creed Odyssey is one of, it not the best, game in the Assassin's Creed franchise—and absolutely a game of the year contender. While some of the new content is a little hit-and-miss, the journey overall is a fun time. Odyssey is a grand next step for the journey Origins started. I am very much enchanted by this game. Assassin’s Creed Odyssey is one of the most charming open world RPGs you’ll play this year. It’s easy to recommend this epic journey to veterans and newcomers alike, but of course, the choice is yours. Odyssey builds upon the foundations of a beloved franchise and I like the way it’s going forward. Assassin’s Creed Odyssey hits all the notes a sequel should. Origins was delightful and Odyssey hits almost all the same notes, so there’s a lot to like about it as well. That solid core formula carries Odyssey a long way, but like Icarus and his wax wings, it’s not enough to reach the bright star on the horizon. Assassin's Creed Odyssey sees the franchise at its strongest and most ambitious yet. Odyssey makes great strides in its massive and dynamic world, and it's a joy to venture out and leave your mark on its ever-changing setting. Assassin’s Creed Odyssey is another accomplished entry in the long-running open-world series. It’s a beautiful game to look at and the story is intriguing, but it feels like a game that could have been a little more ambitious if given more time to develop. Assassin’s Creed Odyssey, for better or worse, feels like a palette swap of Origins. Assassin’s Creed Odyssey is Ubisoft’s latest entry into the franchise, and despite having little connection to its predecessors, remains a solid Action-RPG. Despite its issues, this is a worthwhile odyssey to embark on. 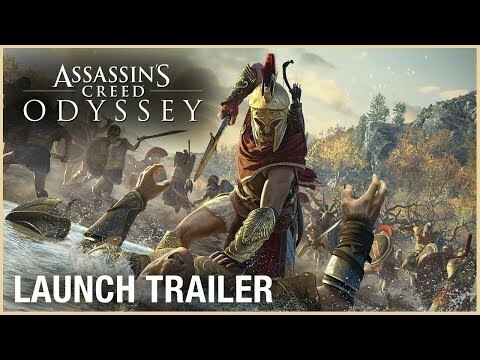 If you enjoyed Assassin’s Creed Origins or want a game you easily sink over eighty hours in through exploration alone you will probably enjoy Odyssey. Assassin’s Creed Odyssey, through its stubbornness and familiarity, sometimes feels like a “best of” compilation of its predecessors without being the best of them. Odyssey is yet another open world game that misinterprets the meaning of more content.